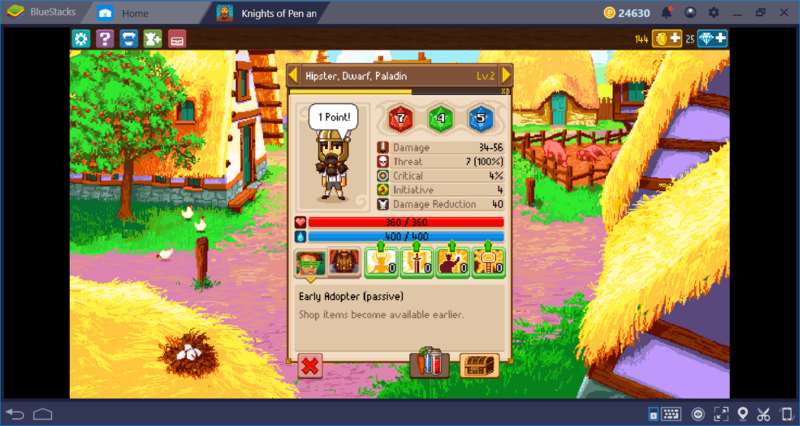 If you’ve played RP (role playing) games on PC before, you already know Paradox: They are the developer/publisher of some pretty famous titles, such as Tyranny, Stellaris, and Crusader Kings. In other words, these guys know how to make good role playing games. 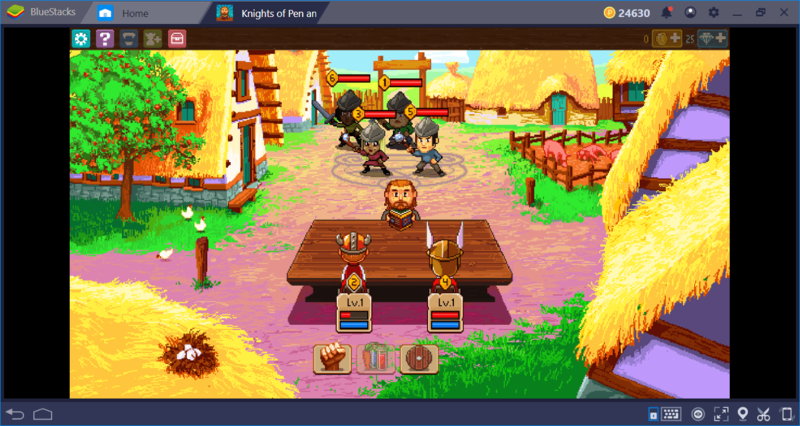 Knights of Pen & Paper is their “other” RP game on mobile platforms and it is quite successful: The first game in the series is played by more than 100,000 people and it was not a “free” game, you had to purchase it. The sequel of the game is more successful – so far, more than 1 million people have tried it. 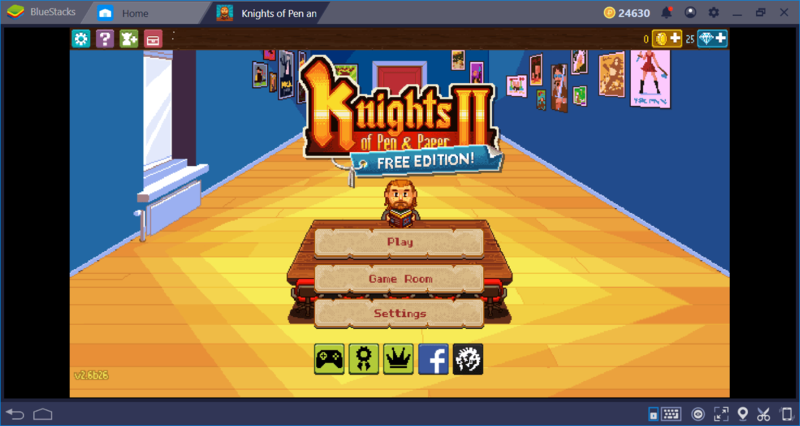 Well, it is our turn to give it a go and find out what Knight of Paper & Pen 2 (KPP2) offers to BlueStacks players: Let’s start our adventure. 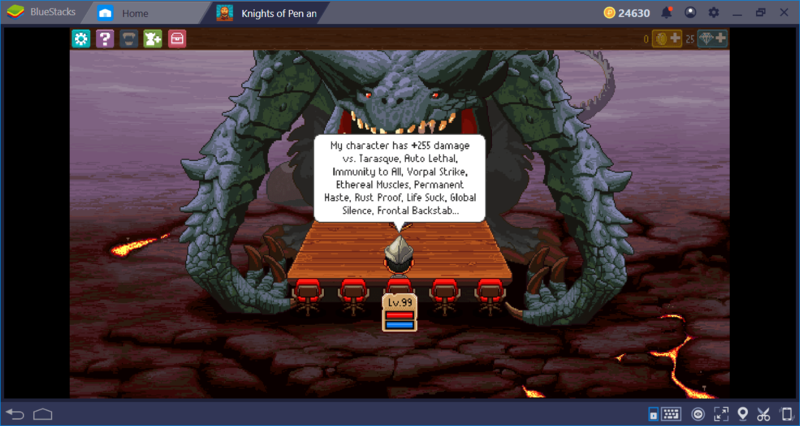 KPP2 is a pixel-art role playing game, inspired by D&D (Dungeons and Dragons) universe. 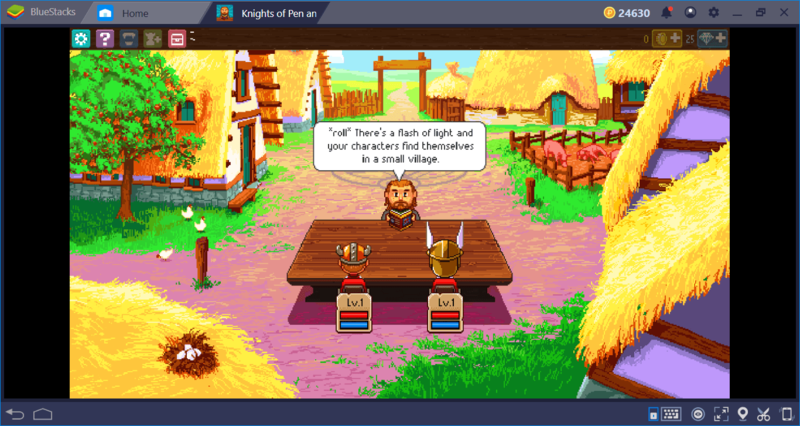 These terms need explanation, so here we go: Pixel-art means that the game has “16-bit” graphics style, so instead of jaw-dropping visuals, it offers old-school aesthetics. Take a look at the screenshot below and you will understand what we mean. And when we say “inspired from D&D”, we mean it: Have you ever played a D&D game with your friends, where one of you becomes the dungeon master and leads the others to an adventure? Same goes for KPP2 – the dungeon master is the game itself, and you control the adventurers. Again, let’s take a look at the screenshot below. 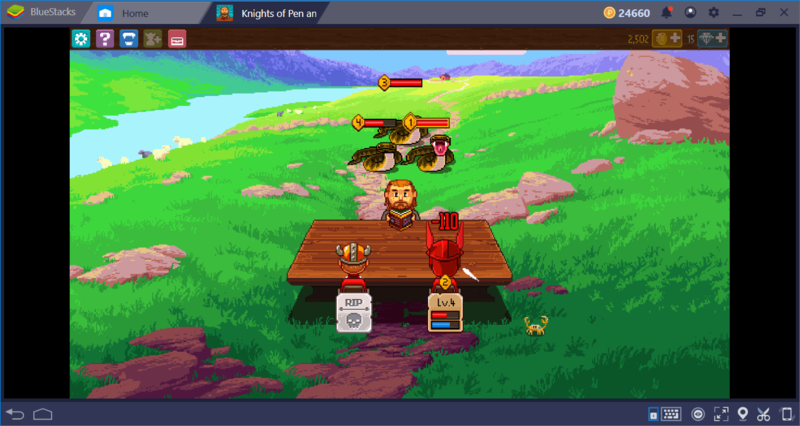 You are controlling the adventurers who are sitting on that table. In front of you, sits the dungeon master: It tells the tale and rolls the dice. And as in all RP games, you are asked to create characters based on different archetypes at the start. There are six different classes you can pick from: Cleric, Paladin, Warrior, Mage, Thief, and Hunter. In the beginning, you can start with a warrior + cleric combo – a fighter with high health points and a healer respectively. Each character has three main attributes: Strength (red crystal), dexterity (green crystal), and intelligence (blue crystal). Warriors, for example, have high strength points and can damage the enemy much more. Thieves, on the other hand, have high critical percentages, which means they can do a lot more damage if the dice rolls in their favor. Simply put, warriors and paladins need strength, hunters and thieves need dexterity, and mages and clerics need intelligence. As you progress in the game and gain XP points, you can level up your characters to make them stronger. Each class comes with different passive bonuses and you can level up these to get more benefits. Basically, get quests, complete them, use the items to empower your characters, and level them up with XP points: The good old RP formula in effect. Speaking of which, KPP2 is not a “serious” game, it has interesting humor and mocks up everything in RP worlds, players themselves included. 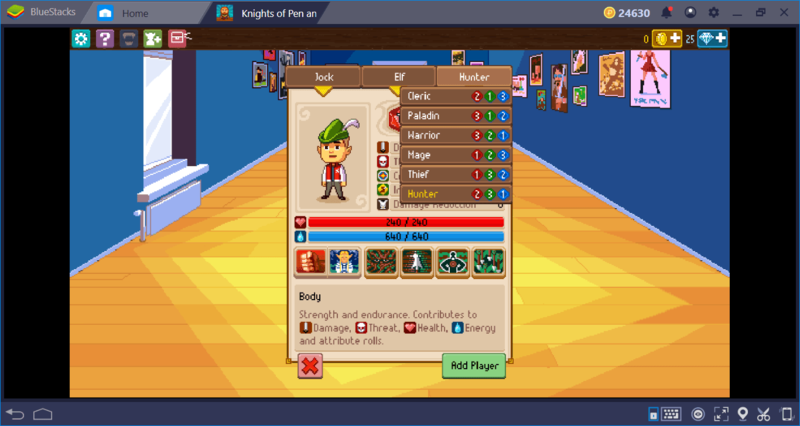 The battle system of KPP2 is turn-based, which means you and your enemies attack in turns. When it is your turn to do something, you can attack, use a potion or activate an ability. The system is pretty easy to understand: You mostly fight big groups of enemies and the numbers next to their health bars show which one will attack next. Attacks can give you a condition, which is a shiny word for debuff. For example, you can get poisoned. Of course, your attacks can give enemies conditions too. Just like a tabletop adventure, a dice is rolled with every action and the results determine the outcome of battles. We are poisoned – oh well. The numbers next to the characters on screen determine the attack turns. And the menu below our characters shows what we can do during the battle: We can stay on the defensive, attack, or use a potion/ability. The battles are hard – KPP2 looks like it is not taking things seriously, but the fights are very serious. Right from the beginning, you get challenged and dying is a pretty common thing in this game. You can resurrect your dead heroes by paying gold, which is a rare currency and used for travel too. So, simply put, don’t die. You cannot win fights by attacking blindly – you need to use potions, special abilities and think two steps ahead. 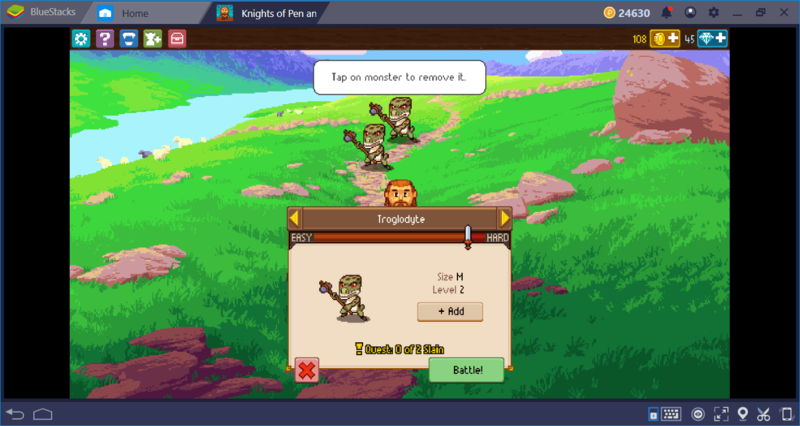 Using BlueStacks will give you several advantages during battles too, as mentioned in another article. 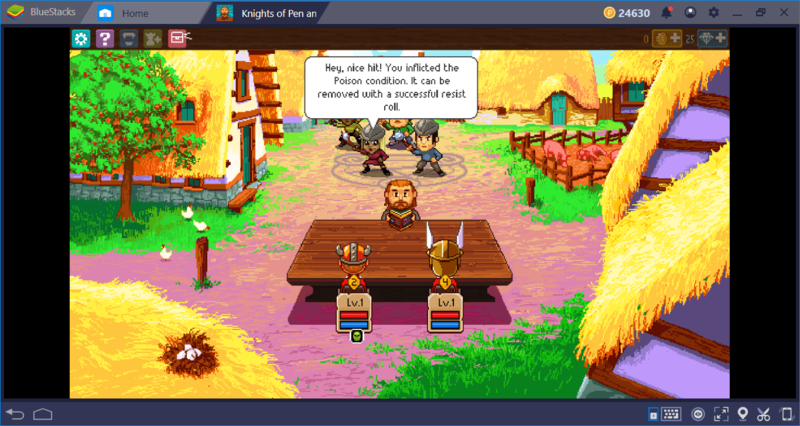 Knights of Pen & Paper 2 is a good sequel that adds lots of things to the first game, and it has enough content that can keep you busy for weeks. Even if you did not play an RP game before, give it a go – we give lots of tips and tricks to starters. This is a big (and fun) world filled with dangers and it is up to you to overcome them: Let’s save the world once again on BlueStacks!